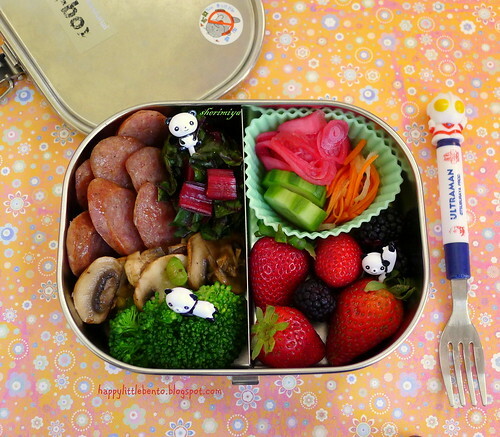 Sausage Mushroom Chard Bento, a photo by sherimiya ♥ on Flickr. It's not Monday, but it still feels like Monday to me... so that's why I'm packing a super easy and quick bento favorite of mine. It usually involves some kind of good (organic, no nitrites) sausage, sauteed mushrooms and quick pan-fried rainbow chard tossed with garlic powder. I finished out this box with steamed broccoli, a little cup of pickled onions, cucumbers and carrot/daikon, and a scattering of farmers market strawberries and blackberries. Are you excited to see colorful fruit and vegetables at the market lately? I definitely am! I've also been pickling more stuff lately, and I'll try to remember to stick some more adventurous combos in here in the next few days. Happy Tuesday! YUM! I love pickled vege - would love to learn how to do it myself. Perhaps a pickling for bento lesson is in your blogs future? Hmmm... good idea! It would be a good reference for me to put it all in one post too. Thanks for the suggestion! Wow, that looks good! Pickles and sausage and mushrooms... oh my! Looks so delish! It's still early here so our little farmer's market hasn't opened yet. Looking at all the variety in your bentos, wish I could visit your market over there! Hi, this looks delicious, but one question-is all this (normally hot) food sent cold?